Portrait taken in Montana-best guess between 1850 and 1920. WWI?? Slouch hat. Single-breasted coat with 5 or 6 buttons. Breast pocket on each side; diagonal, flap with button. Knee-high boots. Curvy double-lines of embroidery above sleeve cuffs. 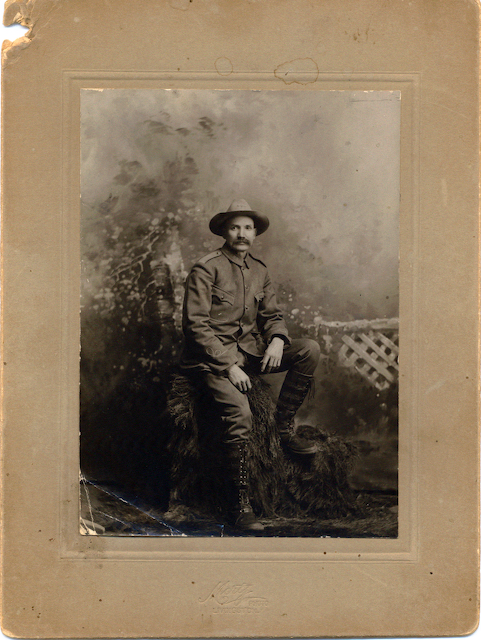 Soldier formally posed sitting on tree stumps with hands on thighs, left foot/knee higher up (resting on stump part), lattice fence in right background. This is one of the few photographs from my husband's family. Could it be a Forest Service uniform? Civil war? WWI? Any help would be appreciated. Browse other questions tagged military war identification uniform or ask your own question.